Take a journey through sound and mantra, Bhavana’s kirtans, like their own voices and music, are dynamic and colourful, serving up a full range of chants, easy to follow and join in, for a powerful experience that takes you to the essential stillness inside. Kirtan is chanting or singing, a form of yoga for the voice done in a group accompanied by music. It requires no background or training, and is easily learnt. Repeating Sanskrit mantras creates a meditative and uplifted mental state, and helps to melt inhibitions that can suppress your voice and expression. You add your voice to those around you, creating a sense of harmony. Some people feel a sense of calm, others a sense of elation- it’s a great way to unblock emotions and a sense of being stuck. The words and melodies are simple and repeated so that you can get into a rhythm and enter a more meditative state conducive to letting go. Bhavana’s kirtans are unique throughout the world for their dynamism, creative use of the ancient mantras, range of sounds, and ability to access so many routes to the calm place within. 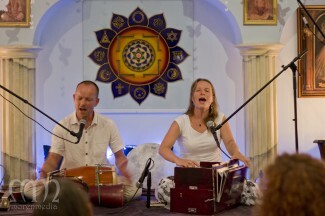 Bhavana lead Kirtan Concerts throughout the UK and Europe. If you would like them to come to your area, please do not hesitate to contact them.